A nameless local lane along the Young Pioneers stadium is a site of the last piece of the tram line closed since May 26, 2002. Once upon a time this was a single-track, one-way line here. 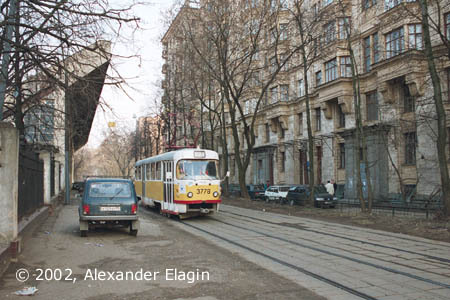 As a construction of a tunnel under Leningradskiy Prospekt was begun in March 1968, tram tracks there were removed, and the single-track was temporary converted to a two-way operation with points at each end and interlocking system with traffic lights. This "temporary" solution proved long-lasting, as usual, and such configuration had existed until 1984, when at last the second track was laid. The points and traffic lights were removed, and this line remained "ordinary" until the very end. 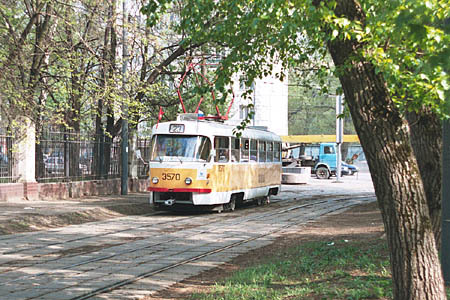 Tram 3570 has just made a turn from Begovaya Street seen in the distance. The stadium area is located right beyond the fence to the left. A view of the lane with the stadium to the left and dwelling houses to the right. There had been virtually no car traffic here. 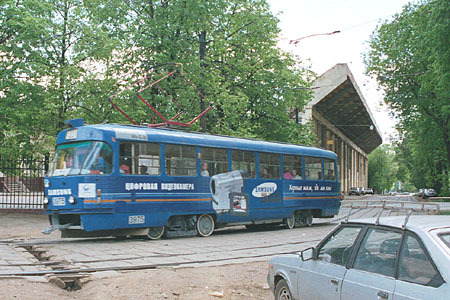 Tram 3975 is going to enter 1st Botkinskiy Proyezd. Note another drain crossing the tracks. 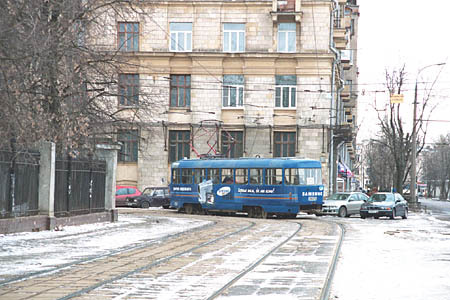 1st Botkinskiy Proyezd and the turn towards Begovaya Street. The Hospital named after Botkin is right ahead, circa a handred steps from a tram stop.